Using honey in recipes always reminds me of my grandmother, who used home raised honey as their only sweetener during WWII. We buy our honey in bulk locally from apiaries we trust, as much of the honey on store shelves has been adulterated or stretched with other ingredients. 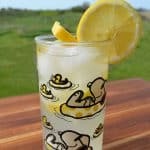 The original honey-sweetened lemonade recipe from Joy with Honey (and most we looked at on the internet) used about half as much water and twice as much honey. That was way too sweet and strong for my palette, especially if you add the honey-lemon ice cubes. You can adjust proportions to your tastes. Do be aware that honey adds a distinctive flavor, and tends to be sweeter than sugar per unit volume, so if you switch to sugar for sweetening, you may need more. You may also wish to experiment with using homemade stevia extract for sweetening. Before I get into the recipe, I'd like to make a note about lemons. All lemons are not created equal. I try to avoid using lemon zest from lemons that are not organic, as any sprays used on the tree will tend to accumulate in the skin. Also, there can be a huge difference in the size of lemons. If a recipe says “the juice from one lemon”, this can be an issue. 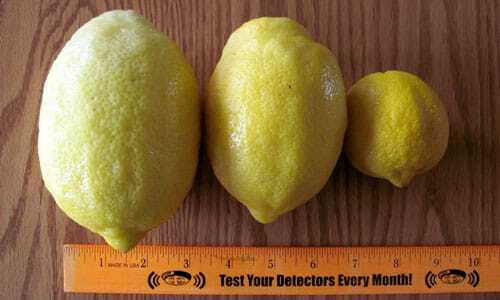 Depending on the size of the lemon, you could get from 1/4 to 1/2 cup, with an average largish lemon yielding around 1/3 cup. Lemons harvested at different times of the year and under different conditions will also yield more or less juice. Case in point – from left to right: Julie's monster lemon, “average” lemon, and small organic lemon. As you can see, quite a bit of variation. 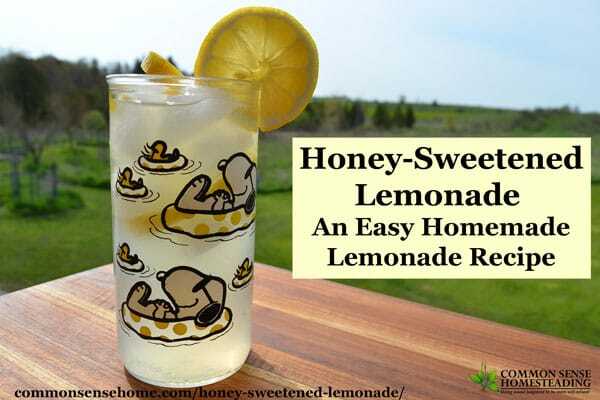 An easy homemade lemonade recipe with honey flavored ice cubes. Warm one cup of water and mix with honey until dissolved. (This helps to avoid the honey settling in the bottom of the pitcher.) Blend with remaining water and lemon juice in a large pitcher. Serve hot or cold. Blend the honey with the hot water and lemon juice. Pour into ice cube trays and freeze at once. (If you let it sit, the honey may settle out.) Serve with lemonade, fruit punch or iced tea (my personal favorite). This recipe will fit into one standard ice cube tray with room to spare. 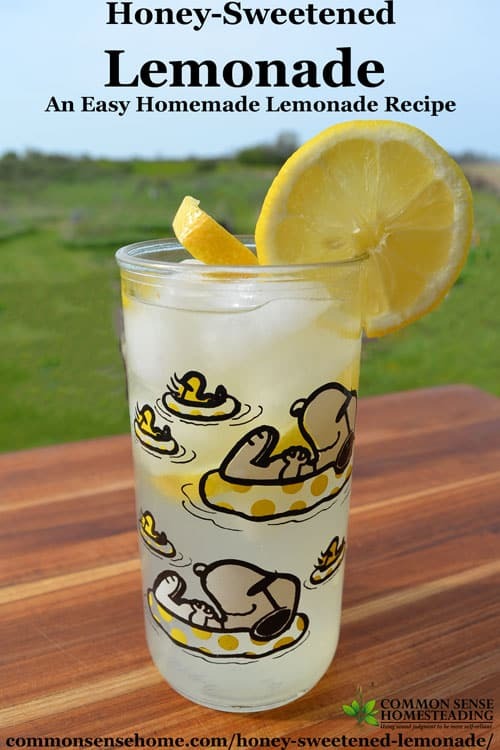 Hot lemonade with honey is great for congestion and sore throats. 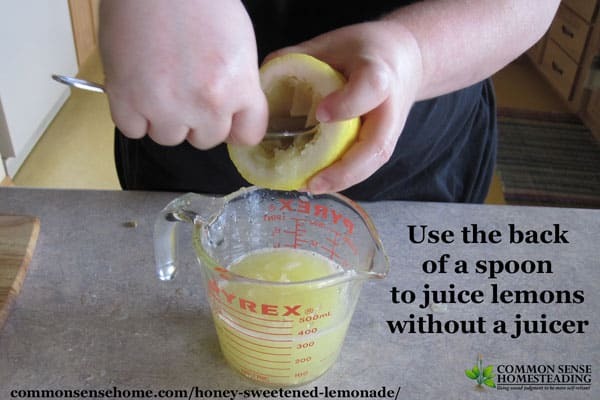 To get the most juice from your lemons, it helps to use lemons that are at room temperature or warmer, rather than those that are fresh out of the refrigerator. Adding lemon verbena or lemon balm also intensifies the flavor. I steep them but kinda tear them first to let the oils out, particularly the verbena as the leaves are a little stiff. I don't rip too much because when they are too small they are a pain to strain unless you use cheesecloth or a very tightly woven strainer. Lemon balm is good but lemon verbena is so very intense it is amazing! I've used both just to flavor water and leave the sweet out entirely. When I do this in a large jar I just leave them in. I hope you enjoy this sweet summer treat!